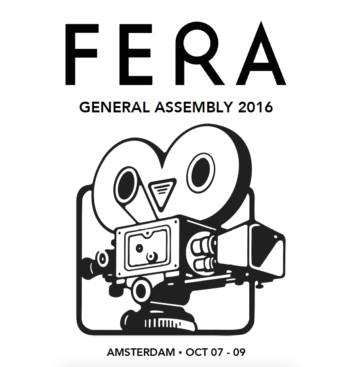 Members of the Federation of European Film Directors (FERA) gathered in Amsterdam, The Netherlands on October 7th through 9th for its annual General Assembly kindly hosted by the Dutch Directors Guild (DDG) and sponsored by VEVAM, EYE Film Museum, the Netherlands Film Fund and Film Commission, the City of Amsterdam and the Netherlands Institute for Sound and Vision. FERA delegates welcomed the recent statement by European Commission President Jean-Claude Juncker that « artists and creators are our crown jewels » as a key step towards acknowledging the central role that Audiovisual Directors have to play in growing the Digital Single Market, and in promoting European cultural diversity. The Assembly further welcomed Juncker’s statement « I want […] authors to be paid fairly for their work, whether it is made in studios or living rooms » as a significant step forward in a rebalancing of the copyright regime in Europe towards fairer terms for authors like audiovisual directors, who are at the origin of all audiovisual works. FERA members also gave a cautious welcome to the Commission’s recently published proposal for a Directive on copyright in the Digital Single Market, particularly its provisions for enhanced transparency through a mandatory reporting obligation in contracts, as well as contract adjustment and dispute resolution mechanisms. However, delegates again expressed their concern that the current regime of unfair contracts and distribution terms means that directors are effectively ‘ripped off twice’ – first at the point when, as freelancers, they are forced into signing initial contracts on unfair terms. And then again, when their rights are sold on without fair compensation. Delegates reasserted FERA’s view that the way to deal with the imbalance is first, by improving the contractual protection of freelance authors through collective bargaining agreements ; and secondly, through an unwaivable right to proportionate remuneration for the use of their works, particularly in the online environment. FERA members commended the Commission’s approach to the promotion of European audiovisual works online in its proposal amending the Audiovisual Media Services Directive, and look forward to further discussions in the European Parliament and Council to ensure that the Digital Single Market proposals provide the European audiovisual sector with a sustainable environment. Nonetheless, they also underlined the danger of the European Commission response to the digital shift in the audiovisual field focused on EU consumers’ cross-border access to content online. This approach threatens the future of European audiovisual creation and the very investment and distribution framework of our sector : territoriality structures the public funding of works, but also the licensing practices to distribute them and bring them to a variety of European audiences, and giving rise to investment in new European films, TV series, documentaries.